NeckTITE Magic is a revolutionary product, and like many other revolutionary products, NeckTITE Magic may take time to understand how to use it. 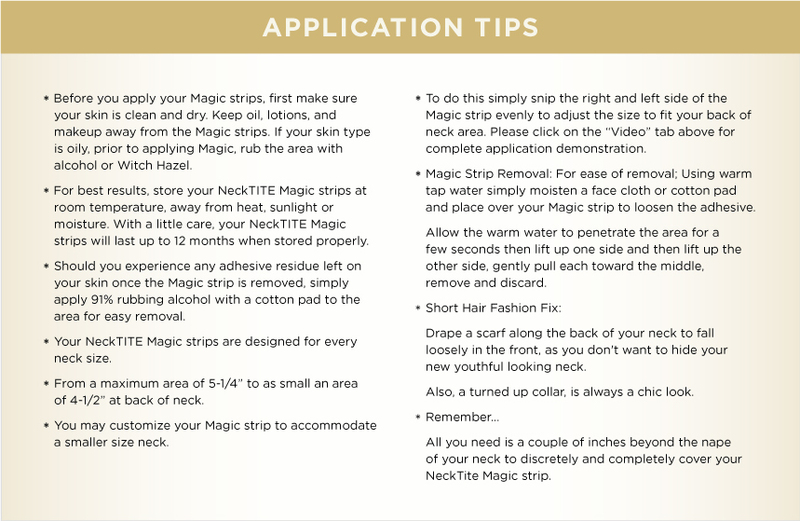 Thankfully, we provide you with some handy tips for applying NeckTITE Magic if you are new to what we offer. Follow these tips the first few times, and then you can get the hang of it quickly and be able to make it a normal part of your life. If you are more visual in learning, we also have an instructional video that demonstrates these application tips for you. As our product is here to help you look your best, we are also here to help you help yourself with NeckTITE Magic. Have fun and enjoy our product!